ABOVE: An Alilaguna water bus at Marco Polo Airport. The Google satellite photo below will display best on a desktop computer, a laptop, or a full-size tablet such as the iPad or iPad Mini. 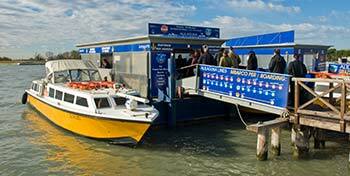 On the map, you'll see Venice Marco Polo Airport's main terminal building (large rectangle) with the water taxi and Alilaguna airport boat piers along the water. Airport buses and land taxis to Venice's automotive gateway, the Piazzale Roma, depart from the arrivals level of the terminal. The Mestre "Fly Bus" to Venezia Mestre Railroad Station also leaves from the lower level of the building.